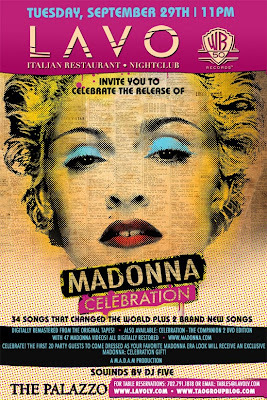 JOIN US TUESDAY SEPTEMBER 29TH AT LAVO AS WE CELEBRATE THE RELEASE OF MADONNAS NEW GREATEST HITS PACKAGE "CELEBRATION"! THE FIRST 20 PEOPLE TO ARRIVE DRESSED IN THEIR FAVORITE MADONNA ERA LOOK WILL RECEIVE A SPECIAL EXCLUSIVE "CELEBRATION" GIFT! DJ VICE - SATURDAYS AT TAO! FIGHT NIGHT IN VEGAS AT TAO! VIDEO: LMFAO AT TAO BEACH LABOR DAY WEEKEND! LMFAO HOST TAO AND TAO BEACH!